Women know this best--and perhaps every man in a relationship with a woman--emotions drive actions. Here at Rerip, our deepest values are environmental stewardship, waste diversion, and thoughtful innovation. As a nonprofit trying to raise awareness around these values, we are often asking people to change their minds and take action. The answer is different for everyone, surely. Usually, though, it is an emotional moment--something more gripping than the latest study, the most recent "How To" list, upcoming march or latest petition. Sometimes it is a death or tragic incident that stops us, changing everything; other times, it is a melody, meditation or movie. Fortunately, art, in all of its forms, can also strike the chord that inspires us to see the world differently. Art challenges our visual systems to interpret images in forms we have yet to name, opening the pathways in the brain that neuroscientists are only beginning to explore. This is why, for example, the brain processes images 60,000 times faster than text. Art can have a profound effect on us, and we can't explain exactly why. Which is why, with great honor, Rerip invites you to Endangered: Exploring California’s Changing Ecosystems. Starting this September 5th-28th with a free opening reception on September 7th from 3:30-6:30 pm, the exhibition will be held at the Mesa College Art Gallery in Kearny Mesa, San Diego. 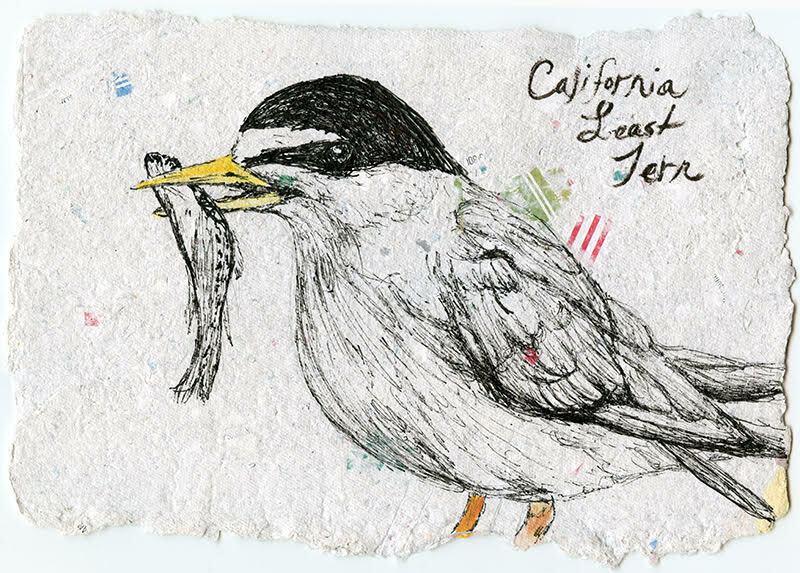 Curated by Danielle Susalla, freelance curator and former Director of Exhibitions at Oceanside Museum of Art, this interactive and educational exhibition bring greater awareness to current environmental issues in California. Through their photographs, paintings, sculptures, and videos, Stephanie Bedwell, Kira Carrillo Corser, Michael Field, Stacie Birky Greene, Sasha Koozel Reibstein, Jim Riley, Jen Trute and Ruth Wallen, explore the undesirable ecological changes in our region that have lead to critical habitats and threatened endangered or extinct species. Various species of birds, bees, fish, foxes, frogs, shellfish, and native plants are being challenged by climate change, human population expansion, habitat fragmentation, land development, and pollution, among other concerns. This exhibition hopes to provide viewers with information about their regional ecosystems empowering them to make positive decisions that will impact the health of our state and planet. 10. Buy beer in aluminum cans. If you have one six-pack of canned beer a week, then you reduce CO2 emissions by 30 kg or the equivalent of the CO2 absorbed by three trees in one year. 9. Remember to put your reusable bags back in your car right after you unload your groceries, so you are not caught without them when you have an unplanned stop. 8. Avoid aerosol sunscreen, it emits chemical particles into the air that people are at risk of inhaling. 7. Consider buying more organic food. Download the free Dirty Dozen App to get to know the foods most highly contaminated with pesticides and chemicals and buy those foods organic when you can. 6. Eat less beef and more vegetarian meals. Each year Americans consume on average 23.3 kg of beef. If that average American substituted chicken for beef, then she or he would reduce CO2 emissions by more than 310 kg, which is the amount of CO2 absorbed by 31 trees a year. 5. Install a water filter on your sink or buy a Brita and stop buying bottled water. 4. Support state legislation to address global warming. 3. Walk or ride your bike as much as you can. We know this, but do we do this? 2. Embrace second-hand clothes and try second-hand apparel shops. 1. Stash Tupperware in your purse before you go out to eat so you avoid bringing home styrofoam or huge boxes to carry out leftovers.